The unconscious litmus test of love is often, like https://shirahvollmermd.wordpress.com/2012/09/20/the-rescuer-needs-to-be-rescued/, an unconscious measurement of the quality of our relationships. For example, Samantha says “Oliver does not really love me. He never buys me gifts.” For Samantha, the litmus test of love is gift-giving. Yet, she is not aware how important gift-giving is to her feeling loved, so she cannot articulate this to Oliver. Laurel says to me, “you don’t really care about me because when I tell you I have a headache, you don’t seem very interested.” For Laurel, paying attention to her somatic symptoms is how she feels loved by another. This is her unconscious litmus test. When these “do or die” moments happen in relationships, I begin to wonder why this one aspect of interchange is so critical to a feeling of being loved. Does it stem from childhood deprivation? Or, does it stem from cultural expectations? In Samantha’s case, we discussed how her mom always pointed to her jewelry, which was mostly given to her by Samantha’s dad, as evidence that they had a “great relationship”. So, Samantha picked a man, Oliver, who disappoints her in this way, perhaps in order to continue to idealize her father. She has made her father into the “good husband” and Oliver into the “bad husband.” The problem is that Oliver does not know how important gifts are to Samantha so he is confused as to why Samantha is always mad at him. In Laurel’s case, she reports that as a little girl when she got sick, no one seemed to pay attention, and so she has carried over the feelings of neglect into our relationship, where she feels that I do not show enough concern for her headaches. This failure of the litmus test brought so much pain to Laurel that she considered abruptly terminating our five year connection. Fortunately, we were able to articulate just how important my attention is, in general, but also specifically about her somatic complaints. Once again, making the unconscious, conscious, changed the course of the relationship. In these cases, the unconscious litmus test was a helpful window into the deep pains of childhood mishaps. Unconscious agendas, the need to rescue, found in so many therapists, so many relationships, and so many seemingly altruistic acts, like saving a dog from the pound, results in anger when the object of the rescue does not comply with the hopes and dreams of the rescuer. So says, one of my students, Frank (not his real name) in today’s ‘Play Class’ where we discussed the dynamics in the story of a fictional seven-year old child, Sam, both parents unable to take care of him, leading a very distant relative, Gerard, to step in and provide parenting, but over time, Gerard has shown an edge of anger and disappointment that this child is not showing the world the benefits of his deeply devoted caretaking. Frank nailed it. The unconscious need to rescue, often results in anger and disappointment because there is an unspoken agenda, in which the dependent soul is vulnerable to not fulfilling, causing despair and agitation in the rescuer. The rescuer, in this case Gerard, seems to be hoping that taking care of Sam is going to make Gerard feel good about his core self. If Gerard’s core self is poorly formed, then Sam will feel the pressure to take care of Gerard, and thus Sam is not able to grow and develop with the freedom to find his core self. Sam, as a sensitive child, perceives this, and then resents Gerard for putting pressure on him to “show off” Gerard’s altruism. Gerard feels this resentment from Sam and then becomes even more angry, that not only is Sam not grateful for his intervention, he is angry at Gerard. This negative dynamic leads both parties feeling unappreciated. If, on the other hand, Gerard did not need Sam to prove that he was a good person, Sam would be free to express himself, and then in that case, he would more likely grow up to be grateful for Gerard’s intervention. In essence, primitive personalities, like Gerard, in this fictional case, begets more primitive personalities, like Sam, since his development is obstructed by Gerard’s unconscious demands. Relationships do best when people appreciate each other, without being too dependent on one another for a sense of confidence and well-being. This applies not only to friendships, romantic relationships and to parenting relationships, but to therapeutic relationships as well. Education is global, like all other industries these days. Medical schools are having training programs around the world. Exchanging information, exchanging students, a long-time practice of college education is now expanding to graduate schools and post-graduate education. UCLA Medical School are now setting up guidelines for their world-wide electives. Cornell Medical School has started a “branch” in Qatar. Two UCLA Child Psychiatry fellows are off to India to explore child mental health in a rural area. Some UCLA Family Medicine Residents ventured off to Haiti after the earthquake to help with the pressing medical needs of the distraught population. This, strikes me, as a new and exciting expansion of medical education. In my day, it was the rare soul who ventured out of the country to explore how medical care is administered in different health care systems. Sure, we were allowed, maybe even encouraged to do electives at other US medical schools, but we were never supported to go beyond our borders. I suspect that this relatively new development goes along with our increase in connectivity and thereby the increase in cross-fertilization. It is wonderful to think that our next generation of physicians will have a broader world view. It is also wonderful, selfishly speaking, to think that there might be opportunities for teaching around the world. Teaching and learning always go together. Global teaching and learning seems so rich and vibrant with new ways of thinking about how to help people. For example, European physicians write prescriptions for spa treatments as a way to help those in mental distress. I think that is brilliant. Trite but true-the world has so much to offer. The Stigma of Mental Illness: A Story Worth Repeating For September 11th! “I was ecstatic. I absolutely loved serving in the military,” she says. But then it came time to renew the security clearance she needed for her job as a satellite communications technician. One question on the form — Question 21 — asked whether she’d sought help from a mental health professional over the past seven years. “I just could not bear sharing that information with all those people when my husband didn’t even know,” she says. You shouldn’t lose your security clearance because someone raped you in the military and you sought counseling. An essential element for many jobs in the military or other areas of government is receiving security clearance. In addition to undergoing a background check, applicants must answer questions about their personal life, including whether they’ve had psychological counseling. Congresswoman Chellie Pingree, a Republican from Maine, says these stories convinced her that Question 21 is simply out of bounds. “It’s one thing to ask, perhaps, if you’ve been hospitalized or had long-term treatment, but just to say have you gone to counseling or therapy, have you gone through a bad time, that shouldn’t cause the potential of you being eliminated from your security clearance,” she says. There’s a precedent for that. 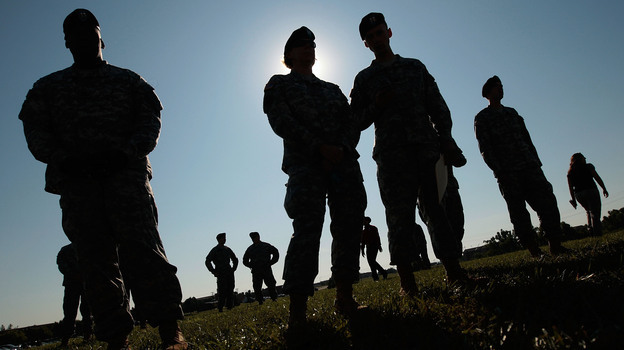 In 2008, the form was changed to exclude counseling for combat stress, as part of the effort to remove the stigma from counseling for post-traumatic stress disorder. Pingree says the same logic should apply here. “You shouldn’t lose your security clearance because someone raped you in the military and you sought counseling,” she says. Not today, though, says Lesser. He says that with millions of people in counseling, the government knows it would be shooting itself in the foot if it excluded those who’ve sought help. Elspeth Cameron Ritchie, a former Army psychiatrist who now works for the government of Washington, D.C., says people avoid getting help so they can answer “no” on the form. “Question 21 is a major deterrent for seeking care in the military or, indeed, in other federal agencies,” she says. Ritchie says Army questionnaires show that fear of losing a security clearance is one reason soldiers don’t seek counseling. So, she says, whatever the official policy is, many people play it safe and avoid putting their clearance at risk. Sherry https://shirahvollmermd.wordpress.com/2012/09/04/mom-dies-appointments-missed-whats-up/ returns to her appointment, but showing up twenty minutes late. “I like that you think of me when I am not here” she says with deep conviction. “Yes, you know that I am waiting for you and that feels good,” I say, highlighting the importance of being ‘held’ in a mental space. Our appointments provide this ‘play space’ such that she can know that during this time, even if she is not physically there, her space is waiting for her. I am impressed that Sherry is in touch with her narcissistic, healthy, need to be part of my mental space. She feels she needs the connection, more than she needs the actual time with me. She can articulate this. Enough said. Nolan, nine years old, wants to show off his muscles to me. He comes in with such enthusiasm, clearly wanting my praise. He appears hungry, in a good way, for positive attention. I think about how we, as adults, lose our openness about wanting to be admired. We. adults, seem to pretend that we don’t need admiration. How do we change from being open about wanting affirmation to being ashamed about that? This was our discussion in what I call my “play class”. Sometimes kids utilize a child psychiatrist to feel good about themselves. They do this in a way which is clear and to the point. Adults, by contrast, also want our admiration, but it usually takes a lot more time for this to be obvious. “This is normal?” One student asks about Nolan. “Absolutely. It is not just normal,” I reply, “but it is also a positive sign about Nolan’s self-confidence. “He understands that I want to appreciate him, and at some deep level, he knows that he needs appreciation.” I say, trying to explain the importance of affirming children, in order to build self-esteem. At the same time, I am mindful of the notion that our current generation of ’emerging adults’ are criticized for being affirmed too much for too little. Parenting in the 80s seemed to be about the need for affirmation, possibly resulting in a generation of adults who feel entitled to tell their bosses what to do. This notion may have some truth, but that does not mean that we should not encourage parents to recognize the strengths in their children. Parents, generally speaking, should encourage exhibitionism as a sign of forward developmental motion. The confidence and pride in one’s own accomplishment is something that many adults have trouble holding on to, maybe as a result of the lack of recognition in childhood. Many folks think of exhibitionism as boastful and insensitive which it can be, but when done with the sweetness of childhood enthusiasm, it is neither. After talking about how so many things can go wrong in child development, I think my students were surprised I said something positive.